(Newser) – A total of 456 people reached the peak of Mount Everest during this past spring climbing season. PTI reports Dinesh and Tarakeshwari Rathod were not among them. The Indian police officers, who claimed to have been the first Indian couple to climb Everest, were banned from climbing any mountain in Nepal for 10 years Tuesday after authorities ruled they made the whole thing up, according to the Guardian. 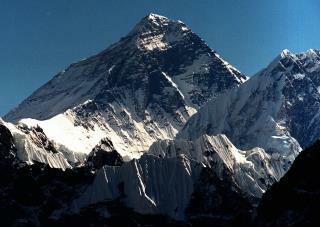 The Rathods claimed to have reached the top of Everest on May 23, producing photos as evidence. Nepalese authorities verified their accomplishment based on those photos, but later rescinded that verification after complaints from other climbers. & Here's What Happens If You LIE About your EMAILS... Hillary Clinton and her staff were "extremely careless" in handling classified data over a private email server while she was secretary of state, FBI Director James Comey said Tuesday — but the FBI is recommending that no charges be brought against her~npr.org What an INJUSTICE that was done for her to be LEFT OFF THE HOOK With a Slap on Her Wrist! Left Off the Hook~to allow someone to escape from a difficult situation! SLAP on the Wrist~a small punishment or NO PUNISHMENT in HIL(LIAR)'S Case when a more severe punishment is deserved! There ya go ALL!! I climbed Mt Everest (I really didn't). Oh great am I now banned from entering your third world country. Can you also ban me from ever having to try to understand one of your country(wo)men on the phone when I am trying to get something fixed in a timely manner?